The club was founded in 1999 as a member of the Kazakhstan Hockey Championship. In 10 seasons of national competition, Barys has won two Championships in 2007–08 and 2008–09. In 2004, Barys was admitted into the Russian ice hockey system, joining its third tier the Pervaya Liga. Their win in Ural-Western Siberia Zone in 2007, led to promotion to the Vysshaya Liga. After a single season of play in the Vysshaya Liga, Barys joined the newly formed Kontinental Hockey League in 2008. In 2013, Barys joined the Astana Presidential Club, a coalition of sports clubs supported by the Sovereign Wealth Fund Samruk-Kazyna. However, Kazakhstan Temir Zholy remains main sponsor of the club. The team serves as a base club for the Kazakhstan national ice hockey team. Barys was founded on 26 November 1999 as the result of resolution accepted by the City Council of Astana. The team was gathered in a semi-professional level by an enthusiast players who were annually playing an amateur tournament for the prize of Mayor of Astana and professional players who came from other teams of the Championship. The team's name, Barys, is derived from the national symbol of Kazakhstan, translated as snow leopard. Nikolai Myshagin became the first head coach in the club's history. Under Myshagin rule, Barys earned silver medals in its first three season of play in the Kazakhstan Hockey Championship. Barys would stay there until 2009. During the 2003–04 season, Barys squaded by junior players to serve as a base club for the Kazakhstan national junior ice hockey team. In 2004, Barys was admitted into the Russian ice hockey system. They made their debut in the Pervaya Liga; in parallel, Barys kept a second team in the Kazakhstan Hockey Championship. Barys' debut in Russia was interesting, with the team doing fairly well. They played three seasons in the Pervaya Liga, where they finished respectively 3rd, 2nd and 1st of the Ural-Western Siberia Zone where they played. With this first place in 2007, Barys was allowed into the Vysshaya Liga. Barys played a single season in the Vysshaya Liga, a good one, where they finished second out of 14 in the Eastern Conference. They reached the playoffs, where they began by sweeping HC Belgorod in three straight games in the first round, before falling to Khimik Voskresensk in four games. Barys however won the Kazakhstan Hockey Championship that year. Barys' main team did not participate in the regular season of the league (however, its affiliate, Barys-2, did), but the league's format was so that the three best team of the league after the regular season would play the three best Kazakh teams (Barys' main team, Kazzinc-Torpedo and Kazakhmys Satpaev, all three were playing in the Vysshaya Liga) in the final round. Barys won the tournament, dethroning defending champions Kazzinc-Torpedo, en route to their first Kazakhstan Hockey Championship title. In 2008, Barys applied to join the newly formed Kontinental Hockey League. The league's authorities allowed Barys in, making it the first Kazakh team to join the new league. The team won its first game in the KHL on 3 September 2008, abroad, defeating Neftekhimik Nizhnekamsk 2–1 in the shootouts. They registered their first home game eleven days later by beating defending Russian champions Salavat Yulaev Ufa 3–2, this time again in shootout. The team finished its first season with a 15th place overall in the league. Barys secured a spot in the playoffs on 26 February 2009, defeating 6-4 Vityaz Chekhov in the last day of the regular season. In the first round of Gagarin Cup playoffs, Barys faced Ak Bars Kazan. Kazan swept Astana three games to nothing to advance to the second round. Kevin Dallman finished the season as the league's fifth best scorer with 28 goals and 30 assists (58 points) record; he also finished as the league's leader for shots on goal with 217. Konstantin Glazachev finished 9th overall in the league in scoring with 52 points. Meanwhile, the team secured a second straight Kazakhstan Hockey Championship title. The 2009–10 season saw Barys have a very similar season than the previous. Veteran Jozef Stümpel finished top scorer of the team, with 52 points, two better than Maxim Spiridonov, who was the best goal scorer of the team with 24. Fan favourite Kevin Dallman also was a major contributor, with 14 goals and 27 assists. Newcomer Jeff Glass did a fine job between the pipes, with 19 wins and a 2.87 goals against average, helping the team finish fourteenth overall of the KHL, a one place improvement from 2008–09. Barys was however once again swept in three games by Ak Bars Kazan in the first round of the playoffs. Barys opened 2010–11 season with Andrei Khomutov as the new head coach. However, the team's previous manager Andrei Shayanov remained in the team as an assistant coach. The team compiled a 20–21–4–9 regular season record with 77 points. As the 7th seed of the Eastern Conference, Barys faced Ak Bars Kazan in the first round of playoffs, again. Ak Bars won series without losing a game 4-0. In the 2011 off-season, Barys announced the signing of Dustin Boyd and Nigel Dawes, who later formed BBD (Bochenski–Boyd–Dawes) line along with Brandon Bochenski. In the beginning of the 2011–12 season, Barys fired Andrei Khomutov after seven losses in eight games. Andrei Shayanov replaced him and led the team to 6th place in the Eastern Conference. Barys fell in the Eastern Conference Quarterfinals to the 3rd seeded Metallurg Magnitogorsk in seven games. During the 2012–13 NHL lockout, Barys strengthened by signing Ryan McDonagh, Victor Hedman and Nik Antropov. Vladimir Krikunov appointed as a new head coach. Barys finished the season with a 23–18–5–6 record for 85 points. In the first round of the 2013 Gagarin Cup playoffs, Barys defeated by Traktor Chelyabinsk 3-4 in series. After the season, Krikunov decided to leave the team, because he refused to coach the Kazakhstan national ice hockey team in parallel with Barys. In the 2013 off-season, Barys appointed Ari-Pekka Selin as a new head coach. On 4 July 2013, Barys officially joined to newly created Astana Presidential Sports Club, the organization supported by Sovereign Wealth Fund Samruk-Kazyna to combine the main sports teams in Astana. Having resigned most of their free agents, the club wouldn't much change in the 2013 off-season, with the exception of losing UFAs Vadim Krasnoslobodtsev, Vitali Novopashin and Mikhail Grigoriev. On 19 June 2013, the team signed goalie Ari Ahonen for one year. Barys strengthened defense, signing Mike Lundin, Maxim Semyonov and Evgeni Blokhin. On 8 August 2013, unrestricted free agent Nik Antropov signed with the Barys a two-year deal. In its season opening game on 8 September 2013, Barys defeated Severstal Cherepovets 10-1. During the season, Barys signed a season long contracts with Cam Barker and Zach Hamill. Barys's Brandon Bochenski and Talgat Zhailauov selected to play in the 2014 KHL All-Star Game, as the result of fans and journalists voting. Barys finished as the 2nd seed in the Eastern Conference. Recording 26 wins, 18 losses, 6 overtime/shootout wins and 4 overtime/shootout losses, they finished with 94 points for the regular season. In the first round of the 2014 Gagarin Cup playoffs, Barys defeated Avtomobilist Yekaterinburg 4–0 in series to overcome the first round for the first time in its KHL history. Barys lost to Salavat Yulaev Ufa in Eastern Conference semifinals 2–4 in series. On May 5, 2014, it was announced that former long-time Barys's captain Kevin Dallman signed a three-year contract. On 18 June 2014, the KHL reported that Andrei Nazarov would move from Donbass Donetsk to become the new head coach at Barys, replacing Ari-Pekka Selin who had been sacked as coach of the Kazakhstan national ice hockey team on 11 June. At the time Barys was formed, the Kazakhstan Sports Palace just began construction. The lack of hockey rinks in Astana, forced Barys to relocate temporarily. During the first two seasons of its existence, the team was based at the arenas of Temirtau, Almaty and Oskemen. The Kazakhstan Sports Palace was opened on 6 March 2001 by the President of Kazakhstan Nursultan Nazarbayev with a game against Yesil Petropavlovsk. It seats 4,070 in the hockey arena. In September 2011, league's authorities considered Kazakhstan Sports Palace the worst in the league. The main reason was the regrettably little capacity. Later, the team's owner Kazakhstan Temir Zholy decided to build the new 11,578 seat Barys Arena, which opened in 2015. The team colours are navy, sky blue and white. The team logo is officially the head of a snow leopard, above the team name "Barys" is written in cyrillic script evoking the style of arabic script. 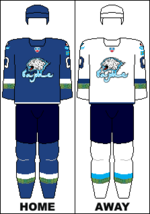 The team's home jersey is mostly navy with sky blue and white trim, while the away jersey is white, with navy and sky blue trim. The current jersey was unveiled on 27 May 2013. The design of the jerseys was presented by Reebok with adding an orange strip on the sleeves. The club's kit supplier is the CCM sportswear company. The team mascot is Barsik, an anthropomorphic snow leopard. Barsik wears a Barys jersey with his name on the back, and the numbers "99". He keeps the crowd excited, signs autographs, participates in entertainment during the intermissions, skates across the ice, throws T-shirts, and runs throughout the aisles of the arena to high five fans. Prior to the Mascots Contest at the 2014 KHL All-Star Game, Barsik changed his skin feature to look more snowy, while previous was looked more leopard. Barys's biggest rival in the Kontinental Hockey League is Ak Bars Kazan. The rivalry between the teams is often referred to as Cat Derby among fans and media. Both teams have the same name meaning snow leopard. Barys is a Kazakh mountain snow leopard, the Ak Bars is the same leopard but the Tatar team emphasised “white” by adding “ak” in front, secondly the team logos resemble each other. The teams played in the first playoff round of the first three KHL seasons, and Ak Bars defeated Barys every year without losing a game. This is a partial list of the last five seasons completed by Barys Astana. For the full season-by-season history, see List of Barys Astana seasons. These are the top-ten point-scorers in KHL history. Figures are updated after each completed KHL regular season. ^ Martin Merk (4 September 2010). "Kapitan Kazakhstan". International Ice Hockey Federation (IIHF). Archived from the original on 14 April 2015. Retrieved 23 March 2014. ^ Jeff Z. Klein (26 October 2012). "5,800 Miles From New York, Ranger Finds Hockey and More". The New York Times. The New York Times. Archived from the original on 2015-04-14. Retrieved 23 March 2014. ^ Yerlan Zhanayev (24 February 2015). "Barys Astana Earns Playoffs Spot for Seventh Straight Season". The Astana Times. Archived from the original on 30 April 2015. Retrieved 30 April 2015. ^ "KHL profile". Kontinental Hockey League. Retrieved 18 July 2015. ^ a b Ilyas Omarov (4 July 2013). "Astana Presidential Sports Club Launched". The Astana Times. Archived from the original on 24 April 2015. Retrieved 31 October 2013. ^ "A. Koreshkov: "Barys" and national team of Kazakhstan are inseparable". Kazinform. 1 April 2015. Retrieved 3 April 2015. ^ "'Barys' is 15 years old". BNews.kz. 26 November 2014. Retrieved 25 March 2015. ^ "Snow Leopard". World Wide Fund for Nature (WWF). Retrieved 23 August 2014. ^ "Central Asian Conservationists Spotlight Snow Leopards". EurasiaNet.org. 23 October 2013. Retrieved 23 August 2014. ^ a b c d e f g h i История [History] (in Russian). Barys Astana. Archived from the original on 12 February 2014. Retrieved 14 March 2014. ^ "Neftekhimik vs. Barys – 03/09/2008 – Recap". Kontinental Hockey League. 3 September 2008. Archived from the original on 5 November 2013. Retrieved 3 June 2013. ^ "Barys vs. Salavat Yulaev – 14/09/2008 – Recap". Kontinental Hockey League. 14 September 2008. Archived from the original on 5 November 2013. Retrieved 30 June 2013. ^ Madi Asanov (6 March 2009). "Kazakh team reaches Continental Hockey League playoffs". CentralAsiaOnline.com. Retrieved 18 March 2014. ^ "2008–09 KHL season stats". Kontinental Hockey League. Retrieved 30 June 2013. ^ Bill Meltzer (28 April 2010). "European championship roll call". National Hockey League. Retrieved 6 April 2014. ^ Андрей Хомутов назначен главным тренером "Барыса" [Andrei Khomutov has appointed as head coach of Barys] (in Russian). Sport Express. 24 June 2010. Retrieved 18 March 2014. ^ Paul Friesen (29 November 2014). "Winnipeggers Nigel Dawes and Dustin Boyd find hockey happiness in Kazakhstan". Winnipeg Sun. Archived from the original on 3 May 2015. Retrieved 3 May 2015. ^ Szymon Szemberg (25 October 2011). "Khomutov released by Barys". International Ice Hockey Federation (IIHF). Archived from the original on 7 May 2015. Retrieved 19 March 2014. ^ "Markov the Hero for Metallurg in KHL Playoffs". RIA Novosti. 11 March 2012. Retrieved 19 March 2014. ^ Ilyas Omarov (26 June 2013). "Finnish Expert Ari-Pekka Selin Becomes Head Coach of Barys". The Astana Times. Archived from the original on 24 April 2015. Retrieved 23 August 2014. ^ "Ari Ahonen in a Confirmed Transaction to Barys Astana". EliteProspects.com. 19 June 2013. Archived from the original on 6 October 2013. Retrieved 9 August 2013. ^ Steven Ellis (11 June 2013). "Mike Lundin Adds Defensive Depth To Barys Astana". Yard Barker. Archived from the original on 17 March 2014. Retrieved 20 July 2013. ^ Askar Sultan (24 July 2013). "Barys Hockey Club Returns to Action". The Astana Times. Retrieved 31 October 2013. ^ "KHL: Nik Antropov Signs Two-Year Deal with Barys Astana". R-Sport. 9 August 2013. Archived from the original on 7 May 2015. Retrieved 9 August 2013. ^ "Hockey: Dawes Shines as Barys Demolishes Severstal". RIA Novosti. 9 September 2013. Archived from the original on 6 May 2015. Retrieved 31 October 2013. ^ "Veteran NHLer Cam Barker signs with KHL squad". NBC Sports. 5 November 2013. Retrieved 6 November 2013. ^ "Barys Astana Sign Former Boston First Rounder Zach Hamill". TheHockeyHouse.net. 5 November 2013. Retrieved 25 December 2013. ^ "All-Star Game rosters complete". Kontinental Hockey League. 24 December 2013. Retrieved 25 December 2013. ^ Кевин Даллмэн подписал трехлетний контракт с «Барысом» [Kevin Dallman signed a three-year contract with Barys] (in Russian). Fontanka.ru. 5 May 2014. Retrieved 6 August 2015. ^ Steven Ellis (1 August 2014). "Former NHLer Andrei Nazarov To Coach Kazakhstan National Team". TheHockeyHouse.net. Retrieved 22 August 2014. ^ "KHL: Spartak and Barys Under Pressure Over Arenas". R-Sport. 26 June 2012. Archived from the original on 7 May 2015. Retrieved 25 November 2013. ^ Дворец спорта "Казахстан" признан худшей ареной в КХЛ [Kazakhstan Sports Palace is considered the worst in the KHL] (in Russian). Tengrinews.kz. 9 July 2011. Retrieved 15 August 2015. ^ Новая арена «Барыса» будет рассчитана на 12 000 мест [The new Barys's home arena will seat 12,000 spectators] (in Russian). Sports.kz. 30 March 2013. Retrieved 13 March 2014. ^ Ilyas Omarov (15 January 2014). "Barys Players Join KHL Stars on Ice in Bratislava". The Astana Times. Retrieved 25 March 2014. ^ Обновленный талисман "Барыса" дебютировал в КХЛ в Астане [Renewed mascot of "Barys" made a debut at the KHL in Astana] (in Russian). Vesti.kz. 14 January 2014. Retrieved 6 May 2015. ^ «Кошачье» дерби [Cat Derby] (in Russian). Kontinental Hockey League. 2 April 2008. Archived from the original on 24 April 2015. Retrieved 30 July 2014. ^ Jan Furst (9 January 2012). "Barys Beats Rival Ak Bars 2:1". The Astana Times. Archived from the original on 24 April 2015. Retrieved 30 July 2014. ^ "Barys Astana team roster". Kontinental Hockey League. Retrieved 14 September 2017. ^ «Барыс» разгромил «Енбек» ["Barys" smashed "Yenbek"] (in Russian). News Factory. 11 September 2006. Archived from the original on 1 May 2015. Retrieved 1 May 2015. ^ Обменялись шайбами [Exchanged pucks] (in Russian). News Factory. 28 November 2006. Archived from the original on 1 May 2015. Retrieved 1 May 2015. ^ a b Maxim Kartashov (13 February 2008). Карыз. Парыз. "Барыс" [Karyz. Paryz. "Barys"] (in Russian). Express-K. Archived from the original on 30 April 2015. Retrieved 1 May 2015. ^ a b c "Team Captaincy History - Barys Astana". EliteProspects.com. Retrieved 23 March 2014. ^ Все золото Лиги [All gold of the League] (in Russian). Kontinental Hockey League. 25 May 2010. Archived from the original on 14 April 2015. Retrieved 30 July 2014. ^ Alexander Petrov (16 May 2009). КХЛ раздала награды [KHL handed out awards] (in Russian). Kommersant. Archived from the original on 24 August 2011. Retrieved 20 May 2011. ^ "Cervenka receives Golden Helmet Award". Ottawa Senators. 24 May 2012. Archived from the original on 14 April 2015. Retrieved 3 April 2015. ^ Лауреаты сезона [Laureates of the season] (in Russian). Kontinental Hockey League. 23 May 2012. Archived from the original on 14 April 2015. Retrieved 30 July 2014. ^ "Best of the Regular Season". Kontinental Hockey League. 26 February 2015. Archived from the original on 14 April 2015. Retrieved 3 April 2015. ^ "Barys Astana ‑ All-Time KHL Leaders". QuantHockey.com. Retrieved 22 March 2019. Wikimedia Commons has media related to Barys Astana.